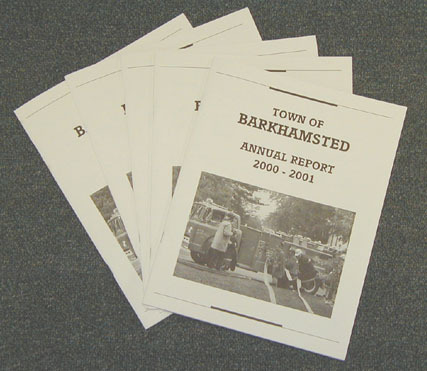 The 2000-2001 Annual Report for the Town of Barkhamsted. 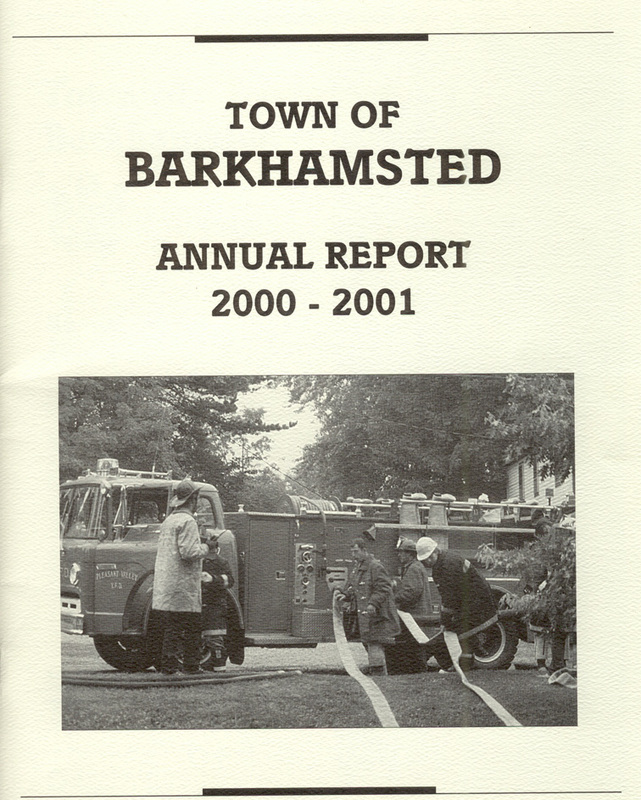 The Annual Report of 2000-2001 is dedicated to all of the people who have served, past and present, as Volunteer Firefighters in the Town of Barkhamsted. Throughout the publication are photographs of the firemen appearing in group photographs, fighting fires, in parades and participating in Fire Prevention Week with the students. It makes one think how dedicated these individuals are and how fortunate the town is to have them. After 9/11 firemen and other safety related officials were given the recognition they were due and it is appropriate to honor our own. The Annual Report gives a good perspective on the community, its boards, commissions and closely related organizations. Municipalities produce Town Reports (Annual Reports) because it is a requirement in Title 7, Chapter 112 Section 7-406 under Municipal Finance. It states, "the Board of Finance or other corresponding board in each town, or, if there is no such board, the selectmen, shall annually prepare and have published a town report." It also lists the requirement of the content of the annual report. Joan Markure, Administrative Assistant to the Board of Selectmen, has been coordinating the town's efforts in this area since 1997. Photo above- Joan Markure with the Town Annual Report. The town has received a number of awards in the Annual Report Contest and these plaques are on display at the Town Offices. 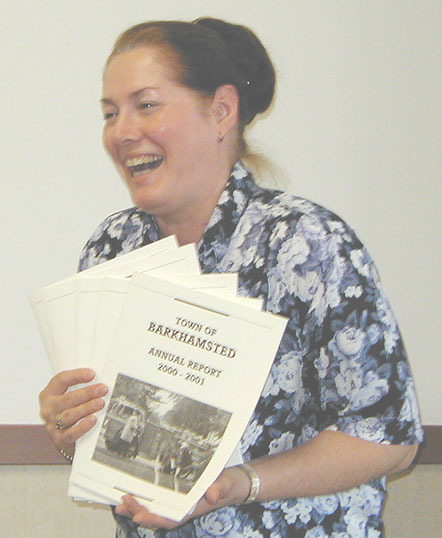 In 1994, which was the 49th Annual Report Contest, Barkhamsted won "Most Outstanding Report Award" from the Institute of Public Service at the University of Connecticut. In recent years since there has been a charge for entering the contest, Barkhamsted officials have not submitted. 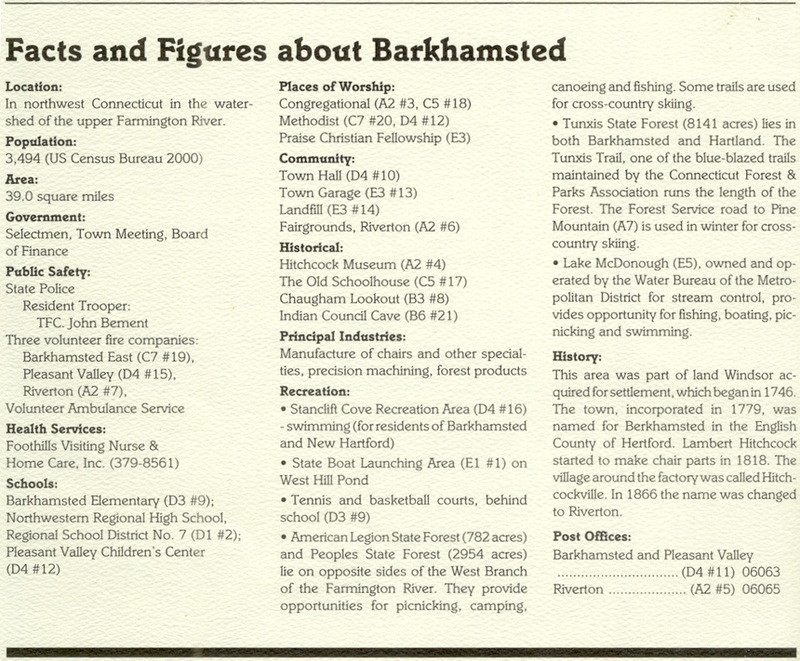 These reports have been professionally produced and Goulet Printery in Barkhamsted printed this year's report. Five hundred (500) copies were produced for $1,800. Shown above- the front cover of the town annual report showing Pleasant Valley volunteer fire fighters in action.. The Board of Finance has eliminated the funding for the Annual Report in the 2002-2003 budget and this is the last year the report will be produced in the present form. Alternative ways of producing the report will be explored. Posting it on a current web site would be an alternative and cost effective. Some towns produce a calendar, which includes the required information as well as useful information and photographs, but it still costs to print. The reports are useful and contain good information. It is a good way to honor the many volunteers and it gives new residents a good perspective on their town government. Shown above- information from the back cover of the annual report.